Welcome to Wicomico Day School. During the past 20 years, we have built a close-knit community that fosters strong relationships among teachers, parents, and students. By modeling the importance of respect for self and others, our faculty is able to bring out the best in our students at all stages of development. Whether you are the parent of an infant seeking nurturing caregivers or the parent of an older child searching for a challenging and engaging academic program, we hope you will spend time reading about our history and philosophy so you can understand the vibrant culture of the school. Most importantly, we hope you will be motivated to visit so you can see our programs and facility first-hand. 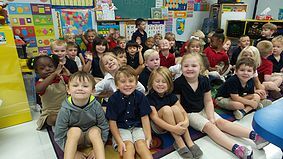 During your tour of the school, you might see an energetic art classroom filled with preschoolers, a writing exercise in first grade, a group of third graders practicing Spanish vocabulary, or a science lab in the middle school. At all levels, you will undoubtedly feel the enthusiasm and see the focus of our students and the outstanding teaching skills of our faculty. Wicomico Day School is a special place. Thank you for taking the time to get to know us. We look forward to getting to know you.